Decks are perfect for families that love to host, entertain, or even indulge in meals outdoors. They are also fantastic investments that instantly boost your home’s value. Adding a new deck to your home can offer so many terrific benefits, so why not learn more about them? Outdoor decks are perfect for birthday parties, summer barbecues, and even an area to just lounge around and bask in the warm summer breeze. Experts say you can easily recoup up to 72% of the initial cost of building the deck thanks to the overall amount your property value will be raised. This is one of the best additions you can make to your home – not even a new bathroom, living room, or sunroom will see that kind of return on investment. Adding a deck can make your home more visually appealing and enhance its overall quality. It can add dimension to a sloped yard, or be stained to match the color scheme of your shutters and of your house to make it look as though it has always been a part of your home. A new deck addition can take less than a week to be completed, making it much more palatable to deal with the construction noise than most other home addition projects. It also comes in significantly less than other home additions, which is a nice perk. Best of all? It gives you extra space to store things such as barbecues, patio furniture, bicycles, and potted plants. Decks are easy to furnish, and let you use your yard for other things such as pools, playgrounds, or gardens. With 40 years of experience, Freedom Fence & Home has provided the highest quality fence and decking materials to its many residential and commercial clients throughout Maryland. Please take a moment to browse our gallery of wood decks and low maintenance decks. Click on any image to enlarge. So, what are you waiting for? 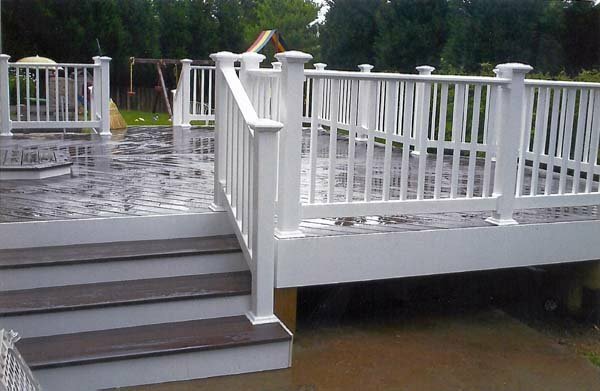 Give us a call today at 443-271-6841 or visit our website to get started on building your brand new outdoor deck! You can also follow us on Facebook and Twitter! This entry was posted on Tuesday, November 19th, 2013	at 9:13 pm	. Both comments and pings are currently closed.